Near-infrared (NIR) spectrometers measure the absorption or reflection of infrared light in the wavelength range 700 nm to 2500 nm (14,300 cm-1 to 4000 cm-1). For most applications, the range 1000 nm to 2500 nm (10,000 cm-1 to 4000 cm-1) is most useful; overtone and combination vibrations involving X-H bonds, (where is X is most often C, N, or O), absorb light with generally stronger absorption at the longer wavelengths. Typical pathlengths for transmission measurements, or penetration depths for reflection measurements, are in the range of one to a few millimeters. 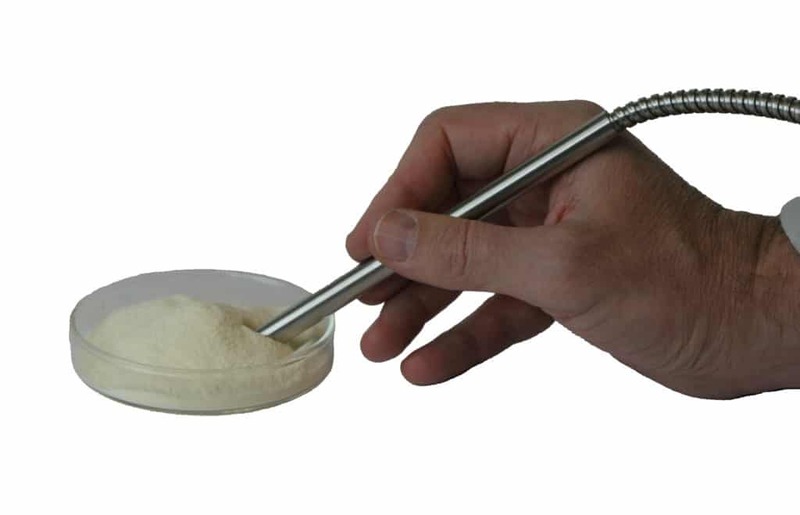 This fast measurement makes NIR a technique very well suited to the analysis of inhomogeneous samples. NIR spectroscopy is not a primary technique so it must be calibrated using samples that have been analyzed using a primary technique. The motivation to do this is that once calibrated, a NIR measurement takes only a few seconds, requires no solvents or other consumables, and can provide values for multiple parameters with only a single measurement. NIR measurements can also be made online using fiber optic cables, enabling online measurements with probes inserted directly into process streams, or via non-contact measurements of products on conveyors, etc. NIR spectrometers can be broadly categorized into four types: filter, scanning monochromator, polychromator (a.k.a. diode array), and Fourier transform. Filter instruments are the simplest, using only a few discreet filters to sample different wavelengths. They are occasionally utilized for simple measurements, such as moisture, but are not suitable for more difficult or general applications. Scanning monochromators were the earliest type of general purpose instrument and are still widely used today because they are easy to engineer and manufacture. They work by dispersing light off of a grating and selecting the wavelength of interest by sending it through a rectangular slit. Yet they do not have any other benefits when compared to Fourier transform instruments. Polychromator (diode array) instruments are also dispersive instruments that measure all the wavelengths simultaneously using an array of detectors. They are very fast and well suited to measurements of rapid moving objects or processes. Since the number of elements in the detector is fixed, either the spectral range or the spectral resolution is limited. Throughput is also limited by the presence of a rectangular slit before the grating. Fourier transform instruments are the latest type of spectrometer to be widely adopted for NIR spectroscopy, although they have been used for over fifty years for measurements at longer wavelengths in the mid-infrared. They do not produce the spectrum directly, but rather measure an interference pattern that is generated by the light combining with itself in an interferometer, using an interferometer, which is then Fourier transformed to obtain the spectrum. There are several benefits to this type of spectrometer. Fourier transform spectrometers have a wide wavelength range and, at the same time, high resolution. The resolution can also be varied depending on the application. They have a very high signal-to-noise ratio (SNR) because they have high optical throughput (throughput advantage, or Jacquinot’s advantage) and measure all wavelengths simultaneously (the multiplex, or Fellgett’s advantage). Fourier transform spectrometers also use a laser as an internal reference to control the interferometer, resulting in unmatched wavelength precision and accuracy, even over very long time frames and changes in temperature (Connes advantage). Lastly, the instrument line shape of Fourier transform spectrometers depends almost entirely on the distance the interferometer scans and the mathematics of the Fourier transform, rather than optical alignment. This means that there is very little difference between spectra from different instruments, making calibration transfer relatively easy, even between instruments from different manufacturers. There are several considerations when purchasing a NIR spectrometer, though not all may be applicable in every case. These include performance, spectral range, ease of use, available software features, ruggedness, portability, cost, and technical support. As previously stated, FT-NIR spectrometers have the advantages of very high SNR and high resolution. It is the only type of NIR spectrometer that can offer these benefits at the same time. High SNR translates directly into lower limits of detection and quantitation. Higher resolution means the spectra have a higher information content, which often leads to better discrimination between spectra of different materials or more robust quantitative models. Also, the wide spectral range of FT-NIR spectrometers includes the longer wavelengths that are critical for certain calibrations. FT-NIR systems also exhibit outstanding stability of the wavelength calibration, even over long time periods and large temperature swings. This means calibrations are more stable over time, and easier to transfer between instruments. Galaxy Scientific’s QuasIR™ series of portable FT-NIR spectrometers is designed to offer the industry a new kind of NIR analysis solution, one that brings together the portability required to move FT-NIR analysis closer to point-of-need, combined with the unmatched spectroscopic performance for the fastest and most accurate results. Galaxy Scientific’s Spectral Sage™ 4 has a user-friendly interface designed to carry out daily near-infrared analysis even for users that are new to spectroscopy. An easy-to-use toolkit, Spectral Sage features rich functions for advanced method development. This software is designed to maximize productivity at all levels. Combined with powerful algorithms, Spectral Sage 4 makes implementation fast and accessible, allowing users to collect, view, process, and store data obtained from the instrument. 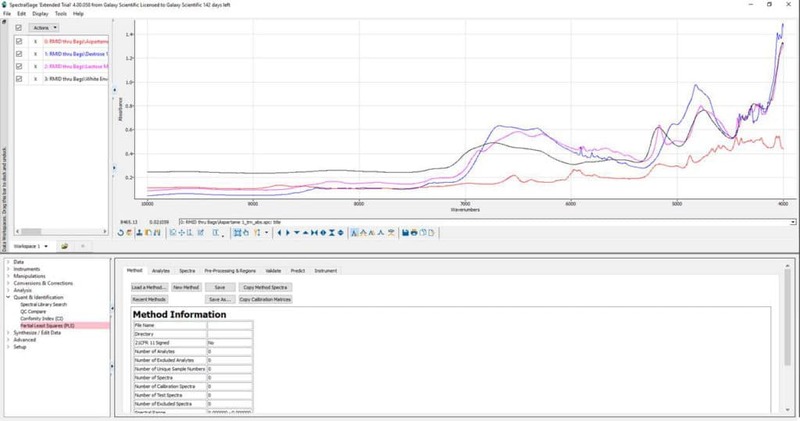 New features streamline the user experience and enable new capabilities to produce better results when converting near-infrared spectra into actionable results. When paired with any of Galaxy’s QuasIR series FT-NIR spectrometers, Spectral Sage 4 is both powerful and easy-to-use. Galaxy Scientific is specialized in the development and marketing of innovative, high-performance portable analytical instrumentation. We have developed a new generation of high-performance field portable platforms which combine next-generation optics with advanced software algorithms providing breakthrough solutions to the most challenging point-of-need applications. Samples can then be analyzed in the field, rather than be taken off-site to separate laboratories. Galaxy Scientific is committed to providing the best value in FT-NIR data collection and analysis.